• Experience: Over our many years in the asphalt industry, we have learned the best methods and products to use to deliver work that is of outstanding quality. • No Subs: We never hire sub-contractors. Our own crews handle all jobs from start to finish, so you will always know who is on your property. • Flexibility: We always strive to meet the needs of our customers. Perhaps you need a maintenance program customized to fit your specific needs, or you need work performed on certain days. Whenever possible, we are always willing to accommodate special requests. Pennsauken NJ weather can take a toll on asphalt surfaces. From one year to the next, you can never be certain of how hot summers might get, how cold the winter will be may bring a massive snowfall. When the ground freezes and thaw repeatedly and then bakes in the summer heat, asphalt surfaces can crack. Damages can also result from deicing chemicals applied to the surface as well as transmission fluid and oil leaks from vehicles. • Sealants -- Your best defense against damages caused by chemicals and weather, sealcoating also improves the appearance of asphalt surfaces in Pennsauken. • Repairs -- Neglected potholes and cracks will worsen, and if ignored for too long, you will be facing a costly repaving job. • Striping -- Our crews are experts at parking lot striping for Pennsauken customers. They also know what markings are required to bring your area into ADA-compliance or comply with local codes for fire lanes, pedestrian crosswalks and other issues. For a free quote, just use our online form to submit your information. If you would prefer to discuss your job over the telephone, you can call us at 856.288.1656. Asphalt Crack Repair -- Timely asphalt crack repair can limit pavement maintenance costs and greatly extend the life of your pavement. There is no more critical pavement maintenance technique than asphalt crack repair. Learn more about asphalt crack repair in Pennsauken, NJ! Asphalt Sealing -- Over time, the sun’s powerful UV rays will dry out and harden the flexible liquid asphalt that binds and creates pavement. Without a quality seal asphalt pavement will lose thickness within just a few years. This can introduce cracking and eventual potholes. When combined with crack sealing, sealcoating can also substantially reduce water penetration of older pavements due to sealing moisture out of the pavement structure. Learn more about the benefits of asphalt sealcoating in Pennsauken, NJ. Asphalt repair -- Repairing defective areas in your parking lot is critical to maintaining a usable lot. Potholes, extreme cracking and other problems can damage vehicles and injure pedestrians. Our experienced experts can determine the best and most cost-effective approach to managing pavement problems. Learn more about our asphalt repair services in Pennsauken. Asphalt Paving -- Asphalt pavement is known for its durability and resilience. It is this strength which makes asphalt pavement the best and most popular choice for applications such as driveways, parking lots, roadways and airstrips. If properly maintained, it need not be replaced for 20 or more years. Learn more about our asphalt paving services in Pennsauken. 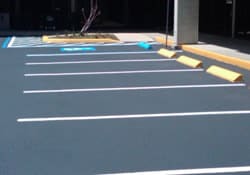 Contact APS for parking lot striping and Sealcoating, Pennsauken, NJ. Call us at 1-856-288-1656 or fill out the Free Job Quote form for a no-obligation consultation with our asphalt specialists.